Slicing the mushrooms ensures they cook through evenly, but if you want to be extra-authentic, leave them whole: the Roma believe that cutting a mushroom will 'bleed its heart'. 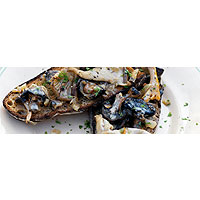 Toss the mushrooms with a little lemon juice. Put the butter and oil in a frying pan over a medium heat and cook the onion for a minute. Cook the mushrooms for 10 minutes until soft and golden; make sure any liquid released evaporates. Season to taste, then stir in the cream and remaining lemon juice and warm through. Sprinkle with parsley and serve at once, on hot toast. Mushrooms work particularly well with aged, oaked chardonnays. This recipe was first published in August 2006.